According to pop wizard Savan Kotecha. The FADER's monthly column Pop Factory interviews the songwriters, producers, and other visionaries behind pop's biggest songs. 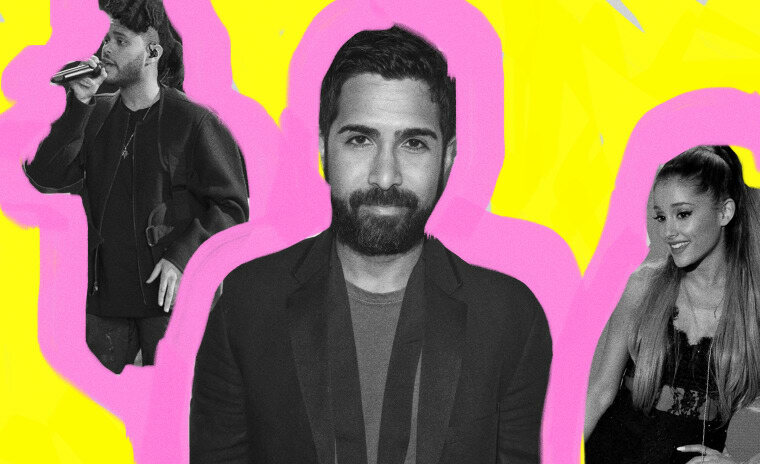 Savan Kotecha is partially responsible for one of pop music’s biggest phenomenons: One Direction. The Texan-born songwriter just managed to score a hit with Usher’s “DJ Got Us Fallin’ In Love Again” when he got a call from Simon Cowell, who asked him if he would come and work on UK reality talent show The X Factor. He said yes and, when the show ended, he helped develop the band and their sound, writing songs like “What Makes You Beautiful” and “Kiss You” for the group’s debut album Up All Night. Cowell had become familiar with the Kotecha’s work in part due to numerous hits for Irish boyband Westlife, another cultural phenomenon who, somehow, managed to bypass America. Then there’s Kotecha’s latest project, PRETTYMUCH, a new boyband also backed by Cowell. "Oh no,” Kotecha says before laughing. “Am I the boyband guy?" A glance over his CV, however, proves that while, yes, boybands are a big part of his discography, his list of credits is hardly one note. Over the years he’s worked on hits like Britney Spears’ “I Wanna Go,” Jessie J’s “Bang Bang,” Demi Lovato’s bi-curious banger “Cool For The Summer,” and even Ginger Spice herself, Geri Halliwell. Was there ever a moment when you realized that you liked boybands particularly? My older sister was a huge New Kids on the Block fan. That was the first time I experienced the whole boyband phenomenon. I remember as a kid she was pretty introverted and didn't have that many friends around. All of a sudden New Kids on the Block happened and I remember very vividly that she then started having all these friends around her. It was that thing that she had in common with other girls. I was dragged into it because I was the younger brother. She had a group of five friends and they'd all be a member of NKOTB. We had a big screen TV at the time and they'd record every single performance and they'd rehearse the dance moves together. So if one friend couldn't make it, I had to replace whoever was missing. I remember being fascinated by how a community or fandom was created and how friendships were made. These are friendships that she still has — they get together and see reunion concerts now. How did you end up from Austin, Texas, to working with an Irish boyband? When I signed my publishing deal it was the end of the Swedish pop boom with Britney and NSYNC. All the American executives just thought there was something in the water there, so they sent me there. I eventually lived there for 15 years. But with Westlife, it was just just writing in the Swedish songwriting community. Actually, my first Westlife cut was a bonus track on one of their big albums. It was called "Good Things That Bad Girls Do," and funnily enough we actually wrote it for Luis Fonsi when he was making an English album. He didn't end up using it, so these guys Quiz & Larossi, who did a lot of Westlife production at the time, played it for the band. They loved it, recorded it, and then I got a call saying, "Hey, you've got a Westlife cut!" They changed my life because they really believed in me as a writer. Westlife were signed to Simon Cowell’s label. Is that how you got involved with The X Factor? Yeah, that’s how the relationship with Simon Cowell developed and stuck. He asked me to do The X Factor for one season. I wasn't sure if I wanted to do it at the time because I was just having a big hit with "DJ Got Us Fallin' In Love" with Usher. I was finally having global worldwide hits in America with these dream artists. And there can be a stigma if you write just boyband stuff. I'm very proud of my Westlife stuff, but at the same time if you want to go in with the cooler America acts, those songs don't really help you. Boybands weren't popular then, either. Exactly. It goes in cycles, right? So during that period, when I finally started getting mentored by Max Martin and got into some of those projects, really because of him, I was like, there's no looking back now. But Simon asked me to meet the contestants. I went into a rehearsal hall at [production company] Freemantle, and one-by-one contestants would come in. I'd sit with them and talk and get a vibe. He just wanted me to see if I thought there was anything special. I always say, and maybe you'll agree, that whenever you meet a big celebrity, the real stars, and there are very few of them, are the ones that if you had your back turned and they walked in the room, you'd feel a shift in the energy and turn around. When the One Direction boys came in you felt that. I noticed that it was the only time that the X Factor producers and whoever else was on staff that day would come in and watch; they wanted to be where the guys were. I remember sending an email to Sonny Takhar, the head of Simon’s label at the time, saying, "You have something in this boyband. I hope you have 360 rights." Obviously what happened after that with the boys was career changing. It was the first time that I had been a part of developing artists and then it blows up to be this huge thing. To be on the ground with something as big as that made me feel reminiscent and happy that I could be a part of something that created a community of fans. That's one of the things that pop music can do and what boybands can do — they can help teenagers through a tough time in their life. That girl in school who's unpopular will have something in common with the cheerleader. When you were writing songs for them, how much of that is written with their different vocal abilities in mind? By then, I knew their voices better than anyone because I was their vocal coach on the show. We knew where their strengths were and where they weren't. And by the middle of One Direction, they were all awesome singers, by the way. It just took a couple moments. In the beginning we had to work with a quick development process and whose voice developed quicker. My big thing was that I wanted to keep it away from R&B. I felt like it had to be guitars and that it had to be pure pop and fun. At least for the first few records I felt like it should have some guilty pleasure aspects to it. The boys were able to break out of it afterwards, clearly, but I noticed when I was growing up when you'd see boybands that it couldn't be trying to be cool, at least not in the beginning. It needed to be fun and youthful. I noticed when I was growing up when you'd see boybands that it couldn't be trying to be cool, at least not in the beginning. It was just important to be fun. Can you tell me about writing "What Makes You Beautiful"? It was the third song I wrote for them. It was a melody that I'd had saved on my phone for months. The lyric, I wrote that for my wife. It was an idea that she'd said something that morning before I went to the studio when I was in the bathroom at my hotel. She'd said, "I feel so ugly today." She's this beautiful Swedish woman and in my mind I was like, "You don't know you're beautiful and that's what makes you beautiful." I wrote that down in my notes app. Then in the studio with [co-writers and producers] Rami Yacoub and Carl Falk, who I wrote a lot of the One Direction stuff with, we started coming up with chords. I didn't know it was going to become what it was. I knew it was good and correct, and I knew it had heart. I remember being at somebody's house for the premiere of American X Factor and Steve Barnett and Rob Stringer, the heads of Columbia Records at the time, came to me and said, "That song is going to be massive in America." I was like, "Really? Okay!" I knew that something was happening with the boys because I was with them a lot. When we'd go to a different city and to places where UK X Factor was syndicated, there'd be 500 girls outside the studio. They were the first band to break through social media. You're working with PRETTYMUCH now. Obviously the groups are different, but has the approach to how you construct a song for a boyband changed for you? It's interesting because I sometimes feel like I've been tainted by hearing songs that are on the radio now. I've had quite a lot of hits since the One Direction days, but when I was working with them I was outside the American radio thing so I was able to go in with a little bit more naivety. It's a challenge to go back to that naivety and not think too cool, especially as I've been working with these acts that could be considered credible. Also nowadays, labels are approaching breaking new artists differently. Whereas with One Direction a big record label could push a button and there were TV shows that they could go on to perform, now there's no magic bullet. It's not even about one song; it's about building a fanbase and streaming. And what works on streaming isn't always big pop music, especially now where it's very urban orientated. How do you break a new pop act that's not an organic culture artist? They kind of have to be memes. Maybe that's the case. But is that manufacturable? I think that it's so user generated and fan generated, that the record companies themselves can't create that. They can set things up to hopefully become that but they can't create that. It's now up to the audience and all one can do, really, is get in front of an audience and hope that it catches on. I would be failing pop fans if I didn't ask you about "Into You.” How did that song come to be? I was focused a lot on the last Ariana record with my frequent collaborator now Ilya [Salmanzadeh], an awesome young Swedish producer. I think the idea [for "Into You"] was theorizing with Ariana. With that album I liked to go in and talk to her about things that she hadn't done before. What was something we could do her voice that's unique. Funnily enough, “Into You” started off with the idea of doing an a cappella song. We started messing around with stuff and Ilya used his voice to layer the background. I knew that she'd never done Michael Jackson rhythm, so we thought we’d emulate that in the chorus. However, very quickly we realized that it should not be an a cappella song. I had the chorus pretty much, so we started jamming on it. Max Martin came in and we started getting the feel and melody right. The lyric took a minute to get right, too. I don't think anyone knew how good "Into You" was until it had Ariana's voice on it. Usually the demos are me singing like a dying cat. I like keeping it like that, although I'm sure she hates my voice at this point. But my thinking is that if it sounds good with a dying cat then the song itself is good. Ariana is such a good singer, so if she demos something it can fool you because anything she sings sounds amazing. So if it sounds good with a not so great singer then the melodies are great. With Ariana, she doesn't just tend to mimic the demo singer. She has such a special voice and feel that she makes it all her own. Why do you think Swedish people are so good at making pop music? I would say that it comes down to a couple of things. One is that music education is really important in Swedish schools. I think Swedish children's songs, like nursery rhymes and stuff, are very melodic and melancholy. The other is that I think that it's the time and effort put into each song. Americans write fast and they do things because they can, not because they should. should. Swedes don't hype things. So in the room, when they're writing stuff, they're not selling themselves on the song; they're not sat that going "This is going to be a smash and it's going to sell a million copies and let's call the A&R guy." It's all about quality. If it's not right, it's okay to take your time and make it right, and that's what I learned while I was there. Take “Into You.” The amount of work and time that was put into that melody and that Max and Ilya put into their production — I don't know that many people that would have sat there for weeks and weeks and weeks like that. The first verse melody we had on "Into You" was pretty good. But we dug and dug, and obviously having someone like Max with that history, taste, and skill of knowing when pop is right. But it could have just been a good song, but the focus on the details and sonically making it amazing is a very Swedish way of doing things.